Jennifer of Beyond the Crib is kicking it! This very cool gal is Mom to EIGHT kiddos. (I know, I officially now have no leg to stand on whatsoever when whining about trying to manage my two.) The really neat thing about Jennifer is that she is using her experience to bless others. I love this statement on her About Us page where she discusses her revamped site, “The new site is intended to be a community resource for parents bringing together my experiences with those of my peers.” Jennifer is working to encourage and support other parents by networking and supporting. I love her mission, and I love the reality that she brings to the blogging world. As you’ll read below where she declares why she is a Mom of the Year, she shares the truth…even when things get embarrassing and fits for gumballs are being thrown all over the grocery store. Love it, Jennifer! Your award is delivered and keep it up, Momma! 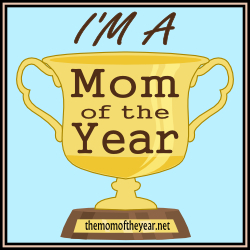 Sarcastically, I have proclaimed that I am the Mom of the Year many times on my parenting journey. There have been forgotten homework assignments, the nights the tooth fairy has accidentally skipped our house, and the time it totally slipped my mind to send in the note allowing my daughter to stay after school for Girl Scouts. The look on her face as she slumped off the bus was enough to grant me the lifetime achievement award. I would do anything for my children. Recently, I was found crawling on my hands and knees in the middle of the grocery store looking for a lost toy. Those days that I sit clutching the armrest of the chair with a smile on my face as my four year old brushes my hair, gives me the right to say that I am pretty good at this job. These instances should make up for the fact that sometimes I forget to carry an extra outfit with me and many a runny nose has been wiped with the inside hem of my shirt. Unlike all those uber-prepared moms and my mother-in-law, I don’t always have a tissue on me or a complete wardrobe in the trunk of my car. I am proud to bear this title, on my good days, bad days, and those embarrassing days too. Nobody is perfect and as moms no one is as critical of us as were are of ourselves. We need to celebrate our successes and laugh about those trying times. Looking back, I can smile at the thought of Lucie climbing into the ball cage. It might not have been my shining parenting moment, but it was one step closer to where I am today. We are all on this journey together. Let’s stand tall and tell the world that we are the Mom of the Year!